Bob chairs the Firm's General Litigation and Trial Practice Group. 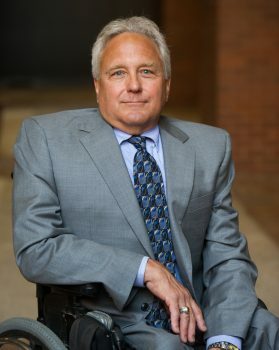 He counsels and defends clients in litigation arising out of professional liability claims, construction defect and delay claims, environmental and toxic tort disputes, and serious bodily injury and wrongful death claims, among a wide variety of other litigation matters. Mr. Kelly joined Jackson & Campbell, P.C. from the Department of Justice in 1988. He became a Director in 1992 and a Shareholder in 1993, and chairs the Firm’s General Litigation and Trial Practice Group. He has been appointed a Fellow of the American Bar Foundation, is rated AV-Preeminent™ by Martindale-Hubbell, and has received the coveted Super Lawyer designation for Washington, D.C. in the fields of professional liability, general litigation, and insurance coverage annually beginning in 2012. He is included on the Roster of Neutrals of the American Arbitration Association (AAA) for construction disputes, and serves as an arbitrator and mediator in disputes brought to the AAA for resolution. He serves as a volunteer arbitrator with the D.C. Bar’s Attorney/Client Arbitration Board, is a Steering Committee member of the Litigation Community of the District of Columbia Bar, and is a member of the Steering Committee of the Construction Law Section of the Maryland State Bar Association. In 2015 he was elected a Fellow of the American College of Coverage and Extra-Contractual Counsel. Bob’s practice has concentrated on the counseling and defense of clients in litigation arising out of construction defect and delay claims, professional liability claims (particularly those brought against architects, engineers and social services providers), environmental and toxic tort disputes (including asbestos, gasoline spills, and interior mold claims), pharmaceutical product liability claims and serious bodily injury and wrongful death claims. He also assists insurance companies in resolving coverage questions arising under general liability and professional liability policies in those and other areas of the law, and represents insurers in coverage litigation. Like any litigator, Bob has had occasion to take on cases in other areas as far afield as those involving employment discrimination, public charity tax issues, and tort suits against adoption agencies. A member of the District of Columbia, Maryland, and Florida bars, Bob’s practice is centered in the regional D.C., Maryland, and Virginia state and federal courts, but he has been admitted pro hac vice to the courts of virtually all other east coast states, and in a good number of western states including Arizona, Montana, Texas, and Wyoming. In addition to his trial work, Bob has represented clients in appeals in several states, including briefing appeals to the Supreme Courts of Delaware, South Carolina, and Texas, and briefing and arguing appeals to the Supreme Courts of Virginia and West Virginia, the Court of Special Appeals of Maryland, and the U.S. Courts of Appeal for the Third, Fourth, Fifth, and Eleventh Circuits. Before coming to Jackson & Campbell, Bob was a Senior Trial Attorney with DOJ’s Civil Division (Torts Branch) defending environmental and toxic tort (asbestos) claims brought against the United States under the Federal Tort Claims Act. He also maintained a significant admiralty and maritime tort caseload. In 1987, he joined the Adjunct Faculty of the Washington College of Law at The American University, where he taught legal writing for seven years. Bob received a Bachelor of Science in Engineering in civil engineering from Princeton University in 1974 and a J.D. from the University of Miami School of Law in 1977. Bob also finds time to volunteer with organizations not related to his legal pursuits. He is the immediate Past President of the Princeton Club of Washington and is an officer of the Princeton Class of 1974. He served as President of the Princeton Club of Washington from 2014 to 2018. Additionally, he serves on the Board of Directors of the Magothy Marina Condominium Association, where he keeps alive his decades-long passion for cruising on the Chesapeake Bay. In 2018, he was elected to membership in the prestigious Cosmos Club in Washington, D.C.
Bob has published and presented on a variety of subjects including tort law, insurance, and professional liability. Click here to see a full list of his speaking engagements and publications. Co-Chair of the Princeton University Alumni Schools Committee for Washington, D.C. Immediate Past President, Princeton Club of Washington, D.C. Member, Cosmos Club, Washington, D.C.